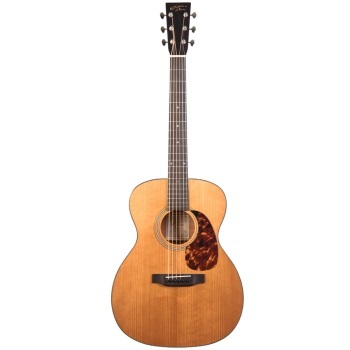 Torrefaction is a specialized heating process used on Recording King Adirondack (Red) spruce tops in which the wood is heated at a low temperature in an oxygen-free environment. The curing process reduces impurities in the wood and results in weight reduction and increased stiffness, producing a similar chemical transformation as wood that has been dried for decades. The end result is a lightweight, extra resonant top that produces similar tone to a vintage instrument that's been loved and played for years.